Article first published as Yukon Quest Dog-Sled Race: Musher to Race for the Brother She Lost on Technorati. Dog coats, a veterinarian kit, fruitcake and other food and snacks, headlamps, batteries, extra clothes, a leatherman knife, lots of matches, sunglasses, goggles, an MP3 player and the spirit of her brother. 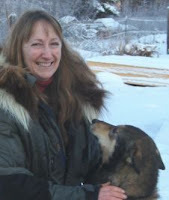 Since her first Yukon Quest International Dog Sled Race in 2002, Griffin has always had her brother “behind the scenes supporting me,” she told Joy Davis on Iditarodblogs.com. But when the Yukon Quest begins Saturday Feb. 5 in Whitehorse of Yukon, Canada, Griffin, 51, will be racing for the first time without her brother behind the scenes. Races? Yes, she did say races. Not only will she be running the Yukon Quest, but Griffin is also set to run the Iditarod in March. According to her bio on the Yukon Quest website, Griffin has finished seven Yukon Quests and one Iditarod, running them both in 2008. That year, she enjoyed her best finish in the Yukon Quest, taking sixth and earning the Sportsman Award. A month later, she finished 45th in the Iditarod. The Yukon Quest was once described as the Iditarod on steroids. It is considered the tougher of the two races, despite the Iditarod being longer at 1,150 miles, from Anchorage to Nome. But whereas the Iditarod has 26 checkpoints (including the start-finish), the Yukon Quest -- from Whitehorse to Fairbanks -- has only 10 checkpoints (including the start-finish) with some that are more than 200 miles apart. The Yukon Quest Trail runs across frozen rivers, climbs four mountain ranges, and passes through isolated, northern villages. With temperatures hitting 40 below, 100 mile-an-hour winds, open water and bad ice all working against the teams, the Yukon Quest is a true test of the capacity of humans and canines, and a tribute to the strength of the ancient bond that unites them.